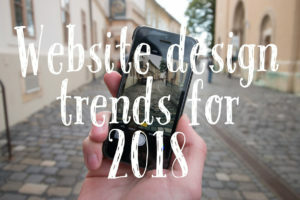 With a new year on the horizon, we like to share what we believe are the top web design trends that may be applicable for the clients we serve. You’ll quickly notice that it’s all about designing for the way we access the web now and where the web is going in the future. Mobile is up over 35% from last year and the trend won’t be slowing down. Search engine giant, Google, has announced that they will use the mobile version of the web as their primary search engine. This means that Google will rank mobile sites higher in their index than sites that are not mobile responsive. If you’re website is not mobile-friendly yet, it’s time to get serious about a website design upgrade. Irregular grids are replacing the uniform grids that have served as the base for WordPress themes. WordPress will likely continue to have security holes and its bulky, buggy code will continue to leave it a target for hackers worldwide. Bold fonts and bright colors are replacing oversize images so users can focus on content that will likely remain the most critical component of page rankings. Unlike images that slow pages down, scaling the size of typography wont impact performance. Responsive design has been around for a number of years because we now use phones, tablets, smart watches, desktops and smart TVs. So this design principle is not going anywhere. For designers, scalable vector graphics (SVGs) have been part of our toolbox for a few years and we expect this graphic format to overtake more traditional files format such as PNG, GIF, and JPG. SVGs don’t lose quality when scaled up or down and don’t affect page speed, so we’ll be integrating more SVG graphics in the sites we build this year and beyond. In 2018, our focus will be on designing simple yet powerful websites that are optimized for mobile devices and care deeply about the user experience. We will use new formats, styles, and technologies to help our clients say more, do more, share more, and enjoy a greater return on their digital investments.